Most folks are content to put their name on the mailbox and leave it at that. 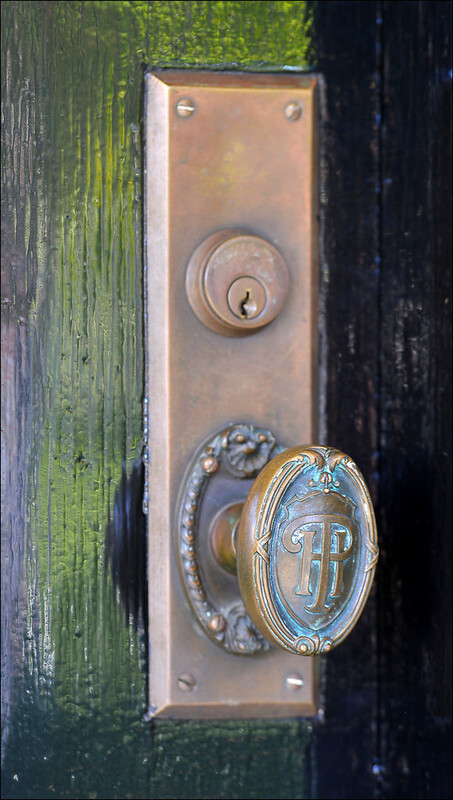 Paul T. Hahman put his moniker on his doorknob – well, his initials, actually. The Hahman home at 718 McDonald Avenue is currently on the market for the first time in ages. The exterior and most of the interior is beautifully preserved, in part because the house has had so few owners. The original family lived there for the first 42 years and the listing agent says the current owners have been there for three decades. That’s 72 out of the 107 years – more than two-thirds of its existence. 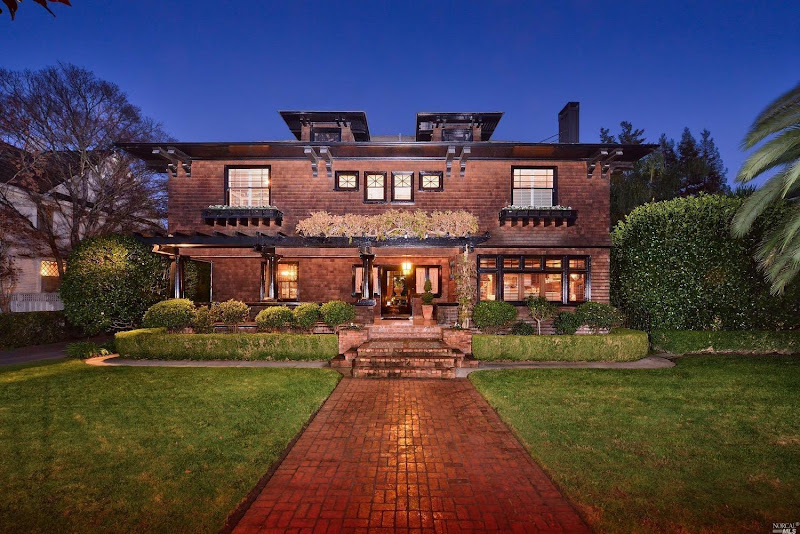 The 1910 Hahman House is the fourth Shingle Style design that Jones created in Santa Rosa and is the most conventional. Where the 1902 Paxton House, 1905 Comstock House and 1908 Saturday Afternoon Club were in the Eastern Shingle Style that tried to be both rustic and elegant, the Hahman House is more like an example of the Prairie School – an American Foursquare with Craftsman features. Still, it must have seemed shockingly modern amidst McDonald Avenue’s dull Victorian mansions. The Hahmans also had the exceptional good taste to hire local master craftsman Frank S. Smith to create a complete set of living room and reception hall furniture intended to harmonize with the house. The furniture – described in the Santa Rosa Republican article transcribed below – took about a year to make. 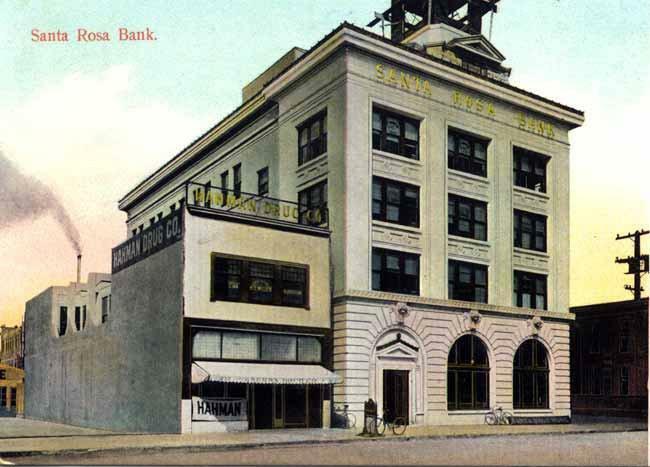 Paul T. Hahman was a pharmacist and had Santa Rosa’s main drug store next to the Empire Building (see postcard). He was part of James Wyatt Oates’ crowd and has often been mentioned here. My favorite story happened about a month after the Hahmans moved into their nice new house, when the town’s veterinarian staggered into the drug store asking for help, having accidentally swallowed a pill containing enough poison to kill several people. Paul gave him an emetic plus some sort of “hypodermic” as most of the doctors in town rushed to the scene, probably partially out of curiosity to see whether the antidote would work. Paul’s parents were Feodor and Henrietta Hahman. In the 1850s Feodor and his partners ran a store in the old Carrillo adobe and then – for reasons which have never been clearly explained – platted out a town they called “Santa Rosa” (see “CITY OF ROSES AND SQUATTERS“). Mr. and Mrs. Paul T. Hahman are moving into their handsome new home on McDonald avenue. Friends who have inspected the residence pronounce its arrangement calculated to prove most comfortable in all respects. Ground was broken for the erection of the Paul Hahman residence on McDonald avenue last week. The Misses Margaret and Henrietta Hahman, the cute daughters of the family, assisted materially in the work. They were each presented with spoons and told to “Dig!” which they proceeded to do as if their little lives depended on it. These spoons will be suitably engraved and in the after years may be handed down as family heirlooms. Mr. and Mrs. Paul T. Hahman were visitors in Petaluma yesterday, consulting Architect Brainerd Jones regarding plans for a new home to be erected at once on McDonald avenue.